Nick Leech visits the Abu Dhabi Municipal Compost Plant and discovers an unlikely oasis amongst the urban waste of Al Mafraq. The drive from Abu Dhabi to Al Mafraq is the same distance as that from the city to the airport, but that’s where the similarities end. If the airport, with its signs, lawns and palm-lined routes is one of Abu Dhabi’s most public spaces, Al Mafraq is very definitely its back of house. All cities have them, Dickensian districts of dust, detritus and dirt dedicated to the disposal of waste but in Abu Dhabi’s case, it’s also the source of a most surprising environmental resource and export, the Abu Dhabi Municipal Compost Plant. Nothing illustrates the difference between the benefits of recycling and the inherent, stinking wastefulness of unsorted household refuse like a visit to the compost plant and to its neighbour, the rubbish dump next door that is also known as Abu Dhabi city’s Municipal waste transfer station. Separated from each other by nothing more than a high concrete wall and a narrow lane, the waste transfer station is one of the few landmarks in Al Mafraq that can be seen from a distance, thanks to a noisy gyre of seagulls that circle constantly above it in search of food. In this compound, rubbish trucks dump street-collected household refuse that is compacted by mechanical diggers before being loaded onto larger trucks and transferred out to permanent tips deep in the desert. As we park my driver and guide for the day, an avuncular Egyptian gentleman from Abu Dhabi’s new Centre for Waste Management, quietly turns off the car’s air conditioning. It’s a matter of seconds before I start to experience the dump’s smell, not as a wafting, nasal fragrance but as a nauseous, gut-wrenching churn in the pit of my stomach that quickly breaks out in a cold, clammy sweat on my forehead. I quickly have to ask for us to leave and feel too nauseous to be able to judge my companion’s reaction. The scene at the Compost Plant immediately next door couldn’t be more different. Not a single seagull has joined me on the short trip but I’m greeted instead by the sight of elegant white egrets gently probing steaming barrows of a substance that looks like finely graded cocoa powder. The nauseous reek of next door’s waste has been replaced with nothing less than the smell of life, florid though this might sound. It’s the scent of potting sheds, fruit and vegetables, regeneration and growth. The aromatic lesson of the waste transfer station could not be any clearer. I’m soon joined by Hashim Ahmad Shamout, the plant’s Head of Compost Production and Sami El Dain Ahmed Said whose job it is to make the daily laboratory checks necessary to ensure the plant’s compost conforms to government-defined specifications and is fit for purpose. Between them these men have worked at the plant for almost 25 years and as they guide me through the manufacturing process it’s clear that compost is their passion as well as their life’s work. The plant makes compost by recycling the green waste produced by local farmers, landscape contractors and by the Municipality in Abu Dhabi’s gardens, parks, farms and landscapes. Three months after the arrival of these green fronds, cuttings and clippings improbable, four metre-high pyramids of dark brown, humus-rich organic Al Qaria compost stand waiting for collection and delivery. This transformation takes place thanks to a carefully monitored process of weighing, sorting, shredding and moistening before two stages of aerobic and anaerobic fermentation take place during which the achievement of the right balance of oxygen, nutrients, temperature and humidity is vital for the production of successful compost. 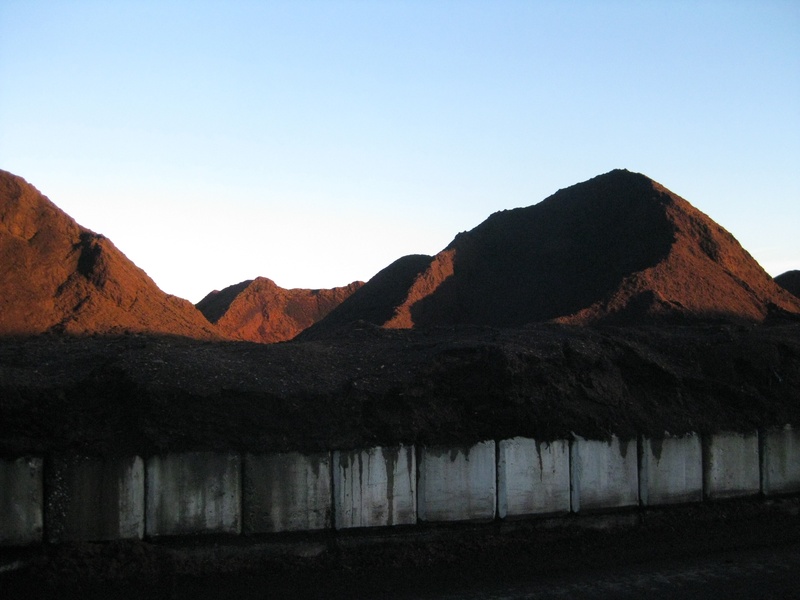 During the aerobic phase the piles of organic matter literally steam as internal temperatures are encouraged to reach over 60° centigrade in order to create safe compost that is free of potentially harmful pathogens. Finally, the compost is sieved to ensure an even consistency and is then allowed to dry before being bagged and released for sale. Last year 30,000 tons of compost was produced from 100,000 tons of green waste in this way. The Abu Dhabi Compost Plant was originally established in 1977 to support local agriculture by providing farmers with a product that would act as a both a fertiliser and soil conditioner while also helping to reduce the need for irrigation by increasing the water-holding capacity of sandy local soils. Since then, the wider environmental benefits of compost and organic waste management have been more fully investigated and it is now understood that compost can play a key role in promotion of soil health, cleaning contaminated soils, and in the prevention of pollution – not least by diverting organic waste away from landfill sites where it often generates methane, a more harmful greenhouse gas than carbon dioxide. Organic waste has been identified as one of eight key management streams by the Centre for Waste Management and the principle of composting has even been included in Estidama, Abu Dhabi’s programme for the sustainable future development of the Emirate. For the professionals at the Abu Dhabi Compost Plant, the journey from green waste to organic compost is a simple, if finely tuned process however for UAE gardeners attempting to produce compost on a domestic scale, the process proves rather more difficult. Fundamental problems start at the very outset and continue throughout the process as they battle with conditions that can make home composting a real challenge. The experience of Helena Kahlstrom, an Abu Dhabi gardener well-used to creating compost at home in the USA is a case in point. When she finally did locate a bin it was broken however, desperate to compost she bought it anyway. Kahlstrom then struggled to prevent it from being used as a dumping ground by local workers and neighbours but some bold signage and carefully pitched conversations finally got the message across. Remarkably, Kahlstrom refused to give in and has now started using an anaerobic Bokashi composting system that uses micro-organisms to generate compost in an airtight bucket. It’s a system that’s enjoying increasingly popularity with green-minded apartment dwellers or those short of space. The big plus for Kahlstrom is that she can happily produce her compost indoors, well out of harm’s way. Al Qaria organic compost is available from the Abu Dhabi Compost Plant for collection or delivery and is available in bulk or in 25kg bags. Prices for self-collection start from 230 AED for a ton or 5.75AED for a bag. Call 02 582 2259 for details. Previous article Want a greener thumb? Take a tablet. Next article What future for gardening in the UAE?